Sketchbook art by Chris Moujaes. 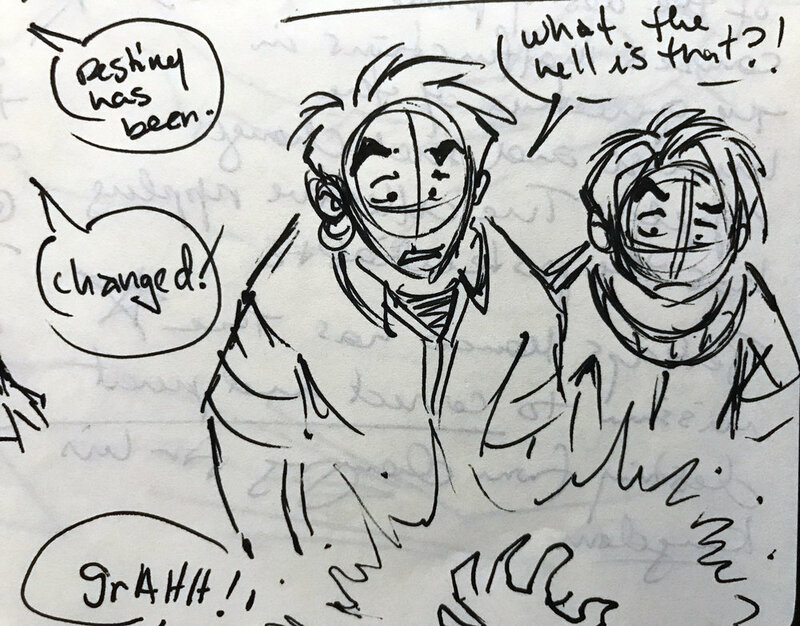 In the previous entry, I talked about a scenario where Marco becomes impatient about his broken Destiny and takes matters into his own hands, causing a rupture. I envisioned something crawling out of that rupture that the boys have never seen before. I'm still working on this idea, and am unsure (or if) it'll show up anywhere, but I really like it. You'll notice a lot of writing on the opposite side of the page. What's funny is that I'm a recovering OCD sufferer, and my notebooks have been a sort of therapy for that. I don't worry about being perfect in them. I don't worry about smudges, ink bleeding, or even the drawings looking perfect either... and it's helped me become a better artist and story writer in that sense.